Unlocking the energy and the invigorating self of a person is not just another stroll in the park anymore. Amidst a population of over 7 billion people, a large chunk has forgotten what it means to live a pleasing and lively life. One of the main reasons behind this are the pressures of our daily life, and the absence of a fit and healthy lifestyle. In order to eradicate this nuisance, most people are turning towards a number of versatile fitness methodologies. Some might give in to a life at the gym, while others might just skim down their daily diet plan, and lose weight rather than body fat. However, for people who are working a desk job, or for entrepreneurs who cannot manage the demands of their newly thriving business, absorbing the fit lifestyle is not a suitable option. In such cases, the numerous desk bikes and pedallers in the marketplace can certainly come in handy. One of the famous desk exercise bikes these days is the FitDesk FDX 2.0. Although popular amidst fitness fanatics, let us review some of the most important factors of this exercise bike; to find out if it is worth investing money on or not! After simple, recumbent and upright exercise bikes were introduced in the marketplace by the maestros of this niche, a brand rose up and offered the desk job slaves a new and improved way of keeping themselves fit and healthy; FitDesk. This brand was set-up almost a decade ago, with the sole aim and purpose of offering people with a chance to workout, while working on their laptops. The brand has introduced various desk bikes and pedallers, which allow people to multi-task, and lead a fit lifestyle. One of it’s better creations is the FitDesk FDX 2.0. 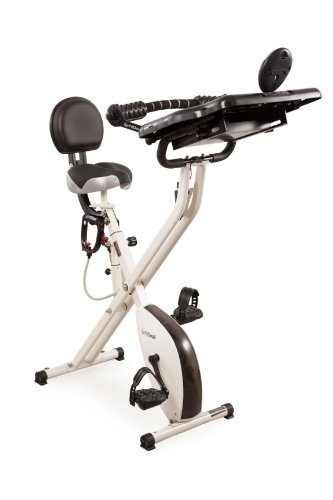 This desk exercise bike allows people to workout, enjoy a massage ad work concurrently. Let us find out more about this bike! The bike consists of dimensions 28’ x 16’ x 45 inches. The frame is produced from pure steel, while the gear box has been manufactured from aluminum. It has a pair of sealed bearings and a high-velocity flywheel. With built-in traveling wheels, the bike also consists of and easy lock and fold structure. The bike also offers a padded armrest which is adjustable, equipped with pre-installed massage rollers. There is a seat backrest for people with a possible backache, and a desk drawer to accommodate different things. With an 8-position magnetic resistance, the bike has also been equipped with a timing and mileage readout meter. One of the most engaging benefits of the FitDesk FDX 2.0 is that it is extremely space-efficient. This not only allows users to keep the bike wherever they want, but also allows them to save a lot of space in their home. Moreover, people who spend most of their day in the office can also set this bike up in their workplace, allowing them to score a session whenever they want. The whole structure is manufactured from pure steel, while the gearbox has been produced from aluminum. This offers exceptional durability and sturdiness, while providing you with a chance to invest in a long-term asset. Unlike most of the desk bikes and pedallers out there in the marketplace, this desk bike offers 8-position magnetic resistance levels to the users. This not only allows users to intensify their workout sessions, but also helps them in increasing their fitness levels gradually. Apart from the regular optional accessories which come with an exercise bike such as traveling wheels, this desk bike also offers a few infamous accessories, such as a desk drawer, massage rollers and an attached back rest. One of the main benefits of this one of a kind desk bike is that it allows you to multi-task whenever and wherever you want. For people who cannot put their laptops on sleep mode, this bike offers a chance to work and workout simultaneously, making it easier to stay fit. The most important and considerable demerit of this exercise bike is that it might not provide the same level of ergonomic stature for each and every user. In simpler words, the bike has a pre-designed comfort level, which most people might fit iNTO. However, the design might not be suited for certain users, which makes the FDX 2.0 an uncomfortable option. Some users are of the view that this bike might not be the perfect choice when it comes to their height. The fixed monitor height may not suit each and every user; inevitably leading them to choose another alternative. 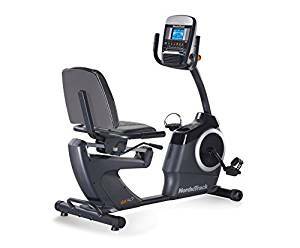 One of the most bothersome demerits of the FitDesk FDX 2.0 is that similar to any other desk exercise bike or pedaller, it can only offer a limited time exercise session. The workout bursts are very brief, and they do not impact a person’s physique or fitness as much as a regular exercise bike might do; which can elongate the time a user takes to achieve enhanced fitness levels. Health and fitness is one of the many niches, which has grown emphatically over the past two decades. From training centers to personal trainers helping you achieve the perfect body you always dreamed of, riveting a fit and healthy lifestyle is not difficult anymore. People are starting to understand the need and importance of a proper and well-planned diet and exercise schedule, while walking toe-to-toe with the competitive world. Using an exercise bike to help you in your long journey of achieving a healthy lifestyle can be the best option for desk job slaves. When it comes down to the FitDesk FDX 2.0, apart from a few minor demerits such as, poor ergonomics or a short exercise burst, this machine is one of the best desk bikes and pedallers in the marketplace – and certainly worth your money.